Every day, a train more than a mile long travels alongside a highway in Albany, N.Y., a half-mile from the state capitol building and even closer to houses. Its cargo is crude oil from North Dakota, which federal regulators and railroads fear is more explosive than other oils. In the past year, Albany has become an unlikely hub for the U.S. oil business, taking in shipments by rail and sending them out by ship down the Hudson River to refineries. Now officials there are trying to get up to speed on how to handle a potential oil-train accident, as are their peers from Chicago to Denver to New Orleans. Bakken crude, which has been involved in three major explosions after rail accidents in the past seven months, is traveling to every corner of the country: west into Washington state and then south to refineries near Los Angeles; south to Gulf Coast refiners; north into Canada; and east to refineries in New Jersey and Philadelphia. Railroads and oil shippers wouldn’t detail oil-train movements through their networks, citing security concerns. The Wall Street Journal identified routes through investor presentations and industry marketing material, as well as interviews with industry officials and experts. The four major freight railroads involved— Union Pacific Corp. , BNSF Railway Co., Canadian Pacific Railway Ltd. and Canadian National Railway Co. —all said they were sharing information about hazardous shipments with local emergency responders. Crude oil is classified as a hazardous substance. Some critics worry about local preparedness. The growth in crude moving on railroads “came out of the blue,” said Peter Iwanowicz, a former head of New York state’s environmental agency and now executive director of a watchdog group called Environmental Advocates of New York. John Layton, a captain in the Albany County Office of Emergency Management, said his agency recently met with Canadian Pacific and Global Partners LP, the storage and distribution firm that is shipping North Dakota crude through New York state. Global Partners, a public company based in Waltham, Mass., declined to comment. Two local officials said Chicago, the largest rail hub in the U.S., might not be prepared for an oil-train accident. On Monday, Chicago Aldermen Edward Burke and Matthew O’Shea proposed levying a fee on every oil-filled railcar that passes through the city, to build up a fund that could be tapped in case of a derailment or fire in the city. 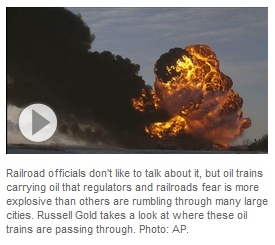 Local officials can’t bar oil trains, which are regulated by the federal government. Some cities say they are ready for the oil-train influx. One is Tacoma, Wash., where the fire department says it has a plan, personnel and equipment, but worries about suburban and rural fire departments. The three explosions stemming from recent oil-train derailments include a July accident in Lac-Mégantic, Quebec, that incinerated the downtown and left 47 people dead. An oil train caught fire in Alabama in November, and a Dec. 30 accident in rural North Dakota sent towering flames into the sky. Neither of those two caused injuries. Concerns about emergency responders helped prompt the federal Pipeline and Hazardous Materials Safety Administration, or PHMSA, to warn that Bakken oil appeared to be more volatile than other crudes, which can burn but seldom have exploded. Dominique Dostie, a firefighter who fought the Lac-Mégantic blaze, said it took 30 hours of applying special foam to extinguish it. “When emergency responders look at crude, they are thinking of a heavy crude that just sits there and is hard to ignite,” said Cynthia Quarterman, head of the federal agency, part of the U.S. Department of Transportation. The PHMSA is investigating whether Bakken crude might contain large amounts of gases and related liquids such as butane, propane and ethane. At the American Petroleum Institute, “We look forward to reviewing PHMSA’s findings as part of a continuing effort to improve the safety of rail transportation,” said a spokesman, Brian Straessle. New regulations that could require the industry to improve, phase out or retrofit tank cars used to haul some crude oil are over a year away, according to a schedule the Transportation Department published Tuesday. The U.S. and Canada both have large refineries on their coasts to handle imported crude oil. Over the past five years, U.S. companies began pumping more oil from the landlocked midcontinent, and the industry has developed new ways of moving it to refineries. The most common new mode is rail, which is handling about 750,000 barrels a day from North Dakota—more oil than comes out of the giant Alaska North Slope oil field. New crude-by-rail projects have been proposed across the country. In New York, state officials said they have received applications from Global Partners to build another rail-to-river facility capable of handling one train a day in New Windsor, N.Y., about 65 miles up the Hudson from New York City. In Vancouver, Wash., refiner Tesoro Corp. and logistics firm Savage Cos. have proposed building a railroad terminal that could handle 360,000 barrels a day, twice the size of the oil terminal in Albany. The general manager of the proposed new rail terminal, Jared Larrabee, said it and waterfront development can co-exist. “We believe the region can and should have both,” he said. Vancouver Fire Dept. Battalion Chief Steve Eldred said hazardous-materials response plans are in place for existing train traffic, but would need to be studied and probably require additional resources to handle more oil trains. Others say while the liquid cargo is labeled as crude, it is exploding like jet fuel. The North Dakota crude “has a tremendous amount volatility and puts out a lot of heat,” said Dennis Jenkerson, the fire chief for St. Louis. WASHINGTON Wary of a series of fiery train derailments elsewhere in North America, California officials are bracing for a huge increase in the amount of crude oil transported by rail into the state and the dangers it brings with it. The move comes as California’s Energy Commission projects that rail deliveries of crude oil could increase to as much of a quarter of the state’s total by 2016. In 2012, only 0.2 percent of the 598 million barrels of oil received by state refiners came by rail, according to the commission. Nearly two-thirds arrived by ocean-going vessels, and another third by pipeline. Chuck Bonham, director of the California Department of Fish and Wildlife, which includes the oil spill unit, said the state is preparing for a shift in deliveries by more traditional modes to rail, and the risks associated with it. The volume of crude oil shipped by rail has increased exponentially in just the past few years, and many state and federal agencies are scrambling to adjust their emergency response plans. Trains brought about 3 million barrels of oil to California last year. In two years, it could be 143 million. The largest chemical spill in state history was the result of a rail accident. In July 1991, a Southern Pacific freight train derailed near the northern California town of Dunsmuir, with one tank car spilling 19,000 gallons of a pesticide into the Sacramento River. The toxic green chemical created a vapor cloud that made residents ill and killed a million fish in a 42-mile stretch of contaminated river. BNSF and Union Pacific, the state’s other major railroad, plan to increase their shipments of crude oil to the state in unit trains. Both railroads operate trains through downtown Sacramento and the state’s other major population centers and along its major waterways, creating new potential hazards for communities and the environment. California officials say they’ve dealt with large amounts of oil spilled from marine vessels and inland wells.